Former Wisconsin offensive lineman Gabe Carimi is making significant strides in returning to the gridiron following a major knee injury that cut his 2011 season short. Carimi participated in OTA's with the Chicago Bears on Tuesday. Following an off-day, he is set to resume team activities on Thursday and will be fully active in all of the team's activities next week. For those looking to get their college football fix, Scott Dochtermann of The Gazette, wrote an interesting piece about the Big Ten and Pac-12 collaboration. It discusses how the plan, conceived by Big Ten Commissioner Jim Delany, may help college football save itself during the turbulent times of conference expansion. Detroit Redwings defenseman Nicklas Lidstrom announced his retirement Thursday after spending 20 years in the NHL. On the surface, that story may not seem to be particularly important in Madison. But, as Andy Baggot of the Wisconsin State Journal points out, Lidstrom's replacement likely hails from Badger country. Two (soon to be three) former Badgers could be suitable fill-ins. In case you missed it, the 2012-13 wrestling schedule was released last week. The Badgers will host Hofstra in the season opener on November 11. The Big Ten dual season will open up on December 7 when Wisconsin will entertain Michigan State. The dual meet season will go out with a bang when Minnesota visits the Fieldhouse on February 10. The Big Ten Championships are set to take place March 9-10 in Champaign, Ill. Staying on the mat, incoming Badger grappler Jesse Thielke qualified for his fourth consecutive FILA Junior World Team on Tuesday. Thielke, who was a four-time state champion at Germantown High School, will compete at 60 Kg in the FILA Junior World Championships September 4-9 in Pattaya, Thailand. Raise your hands if you thought Jon Budmayr was going to play in 2012... o.k., I don't see any hands up. 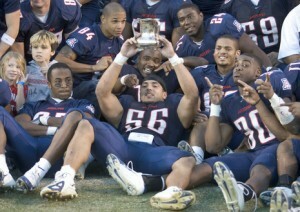 Now, raise your hand if you thought Bart Houston was going to play in 2012.... o.k., I see a few hands up. Well, according to Bret Bielema at Badger Days in the Wisconsin Dells yesterday, neither is going to be happening. Most of us thought Budmayr wasn't going to play because his tricky elbow and arm injury couldn't seem to be figured out. However, that's not what's going to keep him out because the seemingly snake-bit QB now requires hip surgery and will have to miss the 2012 season. He was going to be a 4th year Junior entering this season and now looks more and more likely that Budmayr may never see a significant snap again in a Badgers uniform. Earlier in the spring it was reported that incoming star recruit, Bart Houston, would undergo surgery to remove a cyst in his throwing shoulder. He was expected to miss the start of training camp in the fall, but most assumed he would get in some work and best case scenario would only be used in an emergency and allowed to redshirt. Well, Bielema has taken any chance of him seeing the field in 2012 off the table as he will redshirt for sure and be shut down despite being ahead of schedule in his rehab from the surgery. In my humble opinion that's exactly the right course of action. If he wasn't going to be a starter or significant back up in his true freshman year, why not allow him to fully heal from his injuries while learning the offense in a no pressure situation. Let's not forget that this is the 2nd shoulder surgery for Houston in his young life and having gone through multiple shoulder surgeries young in my own life I can tell you shutting it down and allowing it to fully heal is the best decision they can make. It will allow him to try and correct some of the physical things that may be going wrong around the shoulder and gaining strength around it will only help avoid injury in the future. 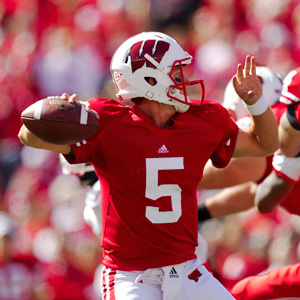 So for 2012 Wisconsin will go with Danny O'Brien, Joel Stave, Joe Brennan, and possibly a returning Curt Phillips. I don't know about you but for me seeing Joel Stave look pretty darn good in the spring game is really huge because relying on Brennan or a completely bionic (what, he's not Robocop yet?) Phillips doesn't exactly bring me out of my seat should O'Brien go down or not pick up the offense (don't see that happening). Whatever happens the depth at this position is questionable at best and Stave will really need to compete well in fall camp for him to have my complete confidence that we're not completely screwed without O'Brien. Another day another great reason to love college sports gets unveiled. This time it's a game I've actually experienced, but one that ranked high enough on the rest of the staff's lists to make it in to the 2nd twenty-five on the list. Don't forget to check out the Civil War that we featured yesterday before digging in to today's addition to the MTB College Sports Bucket List. Like I said, this is a game I've had the privilege of attending in person and I can tell you that it more than lived up to the hype. Typically you may not think of Iowa State and Kansas when talking about the Big 12 as of late, but talk to anyone involved in the conference and they will tell you about a little thing called "Hilton Magic." What is Hilton Magic and why does it matter to Iowa State vs. Kansas? Hilton Magic is a reference to what happens at the home arena of the Cyclone basketball team - Hilton Coliseum. It was coined after a massive 1983 upset over highly ranked Missouri and the legend took off after the Cyclones avenged a massive beat down from Oklahoma State shortly there after. A lot also has to do with the nature of the arena and it's fans. The venue is a completely concrete structure that holds sound in unlike any place I've ever been in and the fans are right on top of the action, something a lot of the newer arenas in America lack. It all adds up to a raucous crowd that's as intimidating as they come for the vast majority of games. Since the advent of "Hilton Magic," Kansas teams that have come in to Ames have left the area wondering what hit them quite often. These two teams' rivalry dates back to the days of the Big 8 where the Cyclones and Jayhawks often found themselves fighting it out for the conference crown during the Johnny Orr era and now in to the Big 12 with the resurgence of the Cyclone program under "The Mayor" Fred Hoiberg. The series may not be overwhelmingly close, it stands 170-58 in favor of Kansas, but it's one of the longest standing series that the Cyclones have played and these two have battled it out since the days of the original Missouri Valley Conference, through the Big 6 & Big 8, up to today's version of the Big XII. However lopsided the series may seem the games are very competitive, especially in Ames where the record is 66-36 in favor of the Jayhawks. In Lawrence it's not nearly the same with ISU only gaining 15 victories in it's history. However, throw records out of the window when these two meet, these teams give each other everything they have and then some on a regular basis. Sometimes it's not the record, but how the games are played and more often than not no matter the venue these two teams put on a show. Don't believe me? Ask any current or former Jayhawk what arena and team outside of the Tigers of Missouri they would least like to play in and Hilton will be the next word out of their mouths. This game and rivalry will take on a bit more meaning going forward because the biggest rivalry in the conference in terms of basketball is no more thanks to Missouri's departure to the SEC and the unwillingness to play the game on behalf of the Tigers. That fact leaves ISU vs. Kansas as the most recognizable game with any sort of history in the conference. It's sure to be an interesting new era in the redone Big XII to say the least and Kansas and Iowa State just may have a few things to say about the direction the on the court product takes going forward. Unbelievably we've reached the quarter pole in our journey through the biggest and best that college sports have to offer here on the MTB College Sports Bucket List. We've covered "Duels in the Desert", some of the best that D3 sports has to offer, and much more, so look through the site and you'll find quite a few gems. In fact one of those rare gems was unveiled yesterday in the battle between St. Norbert College and Wisconsin-Superior in D3 Hockey, so check it out here. We've covered a lot of interesting games, but never have we covered something so bitter that they actually pride themselves in playing in the "Civil War", but that's exactly what happens every season in the Northwest as the Ducks and Beavers go at it in the annual grudge match in Oregon. The 2012 season will mark the 96th edition of the Civil War and if you weren't paying attention to the games out west between these two until Oregon became more nationally relevant you'd have no clue of just how bitter, close, and full of upsets this rivalry actually is. Currently the series stands at 46-43-5 in favor of Oregon, but it's a series that's always been pretty close. The Ducks and Beavers both have the same longest winning streaks in the series at eight games. Last season Oregon destroyed the Beavers 49-21 in route to the Rose Bowl, which we all know how that ended. It's that time of the year already: Preseason College Football Magazine time (or as it's known in my house - College Football Magazine Day [channeling my inner Billy Madison voice]). I thought I'd spare you the time and money to give you the information that you need to know out of each magazine as they become available to me. It just so happens that Lindy's is the first out of the gate and it's chalk full of interesting tidbits for us Badger faithful. Let this be a start of a glorious beginning of summer tradition here for you fine readers of MTB and for us here, so let's kick it off! The St. Norbert mens hockey team has had their way with the Northern Collegiate Hockey Association over the last decade. In the past ten seasons, the Green Knights have claimed nine regular season titles and captured eight Peters Cups. If there has been a thorn in the side of the perennial powerhouse it has been UW-Superior. Arguably, the Yellowjackets have been able to run with SNC better than any other school in the conference. The two schools have met 64 times and St. Norbert owns a 31-21-12 advantage in the all-time series. However, SNC is just 8-9-9 when visiting Wessman Arena in Superior. It is the only venue in the conference where the Green Knights do not own a winning record. Speaking of venues, both Wessman Arena and the Cornerstone Community Center provide a unique college hockey experience that can be appreciated by any fan. Wessman Arena, one of the largest facilities in the conference, holds a capacity of 3,000. The more intimate Cornerstone Community Center gives spectators a chance to get up close and personal with one of the best programs in the nation. The enrollments of both institutions hover around the 2,000 mark. But the fans (knowledegeable fans at that) turn out in droves to support their teams adding to the atmosphere of the already intense competition. Adding to the drama of the rivalry is the fact that the two men who patrol the bench also played in the NCHA in their collegiate days. They are also two of the longest tenured coaches in the league. SNC head coach Tim Coghlin was a two-time All-American defenseman at UW-Stevens Point where he was the captain on the 1989 national championship team. He concluded his 19th season as head coach at St. Norbert where he currently owns a 411-113-45 record. He has brought home 13 NCHA regular season titles, 10 Peters Cups and three national championships. UWS head man Dan Stauber appeared in 99 games for Superior during his collegiate career and tallied 118 points. Last year, wrapped up his 12th season at the helm of the Yellowjackets where he has posted a 218-86-50 mark. With St. Norbert taking its second consecutive national title (it's third since 2008) and posting a 2-0-1 record against Superior last season, the Yellowjackets have fuel to add to the fire comeing into the 2012-13 season. As competitive as the rivalry has been, its future remains in question. The NCHA is set to disband after the upcoming season to give way to Wisconsin Intercollegiate Athletic Conference hockey. UWS is already assured a spot in the WIAC, but, as it stands now, St. Norbert will be without a conference for the 2013-14 campaign. On behalf of the staff here at MTB I want to say a huge thank you to all those Badger fans out there so bravely and proudly serving our country and those that have served our country or given the ultimate sacrifice of their lives. 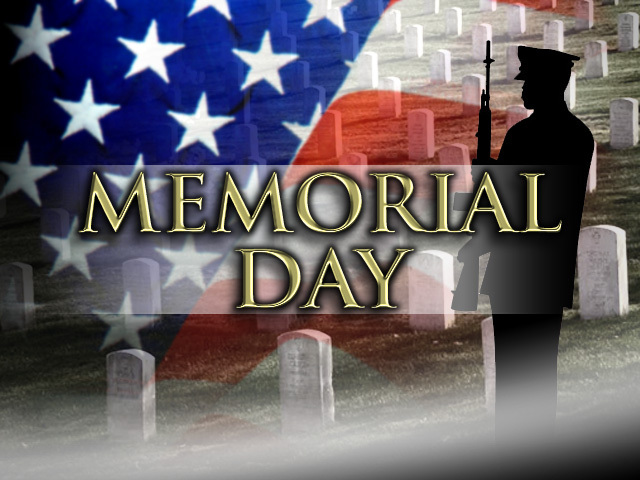 Without your sacrifice, honor, and selflessness our country wouldn't be! All we ask is that you take some time today to remember those that have fallen in defense of the Red, White, and Blue and if you see a veteran or active service military person today make sure you say THANK YOU and perhaps buy that man/woman a drink or a meal to show your gratitude! On a personal note I want to say thank you to the countless members of my family - from Grandparents to Cousins - who have bravely served this country with honor! Especially to my brother Bryan and his wife Lauren who are currently serving in the Air Force - keep up the great work and THANK YOU!! On Wisconsin and God Bless America! Home of the Free, because of the Brave! It's Memorial Day Weekend, but the countdown must go on.... After a few football games that have smaller followings it's time to head to the land of the rising sun for a game that may be a bit more known amongst the casuals out there. Before we do here is No. 79 & No. 78 from earlier this weekend for your viewing pleasure. Many Badger fans know that Wisconsin vs. Minnesota holds the record for most played rivalry in FBS football, however the "Duel in the Desert" between the Wildcats of Arizona and the Sun Devils of Arizona State holds a record of it's own. 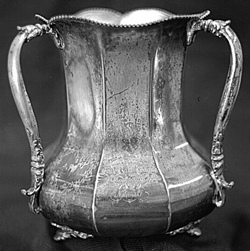 The Territorial Cup that they now play for on a traveling basis every season was first awarded in 1899, making it the oldest trophy in college football according to the NCAA. In fact, one could argue that the history behind the trophy itself has a lot to do with the hatred between these two schools. Well than and the whole big brother/little brother thing. After the Arizona State victory in that 1899 game (then known as Arizona Normal School) the trophy went "missing" for the next 80 years and after it's rediscovery it's ownership was a point of contention between the two schools until they finally agreed to make it a traveling trophy. But the hatred between these schools goes much deeper it goes to the culture of the cities of Tempe and Tuscon as well as the academic reputations and nightlife of the schools. ASU is seen as a "party school" and Arizona has a bit more of an "academic school" reputation, but both have their share of great academics and party school in them. For those of us 35 and younger the memories of these two teams would lead you to believe that the Sun Devils are the better of the two teams and while for the most part that may be correct, it's not the case in the series as Arizona holds a 47-37-1 lead in the "Duel in the Desert." But in games since the move from the WAC to the Pac-12 (Pac-10 originally) the Sun Devils have the advantage at 19-14-1. The upcoming 2012 game certainly will have a bit more spice to it as both the Sun Devils and Wildcats will be welcoming some higher profile coaches in Todd Graham and Rich Rodriguez respectively. Not only that but the way the last few games have ended between these teams with ASU winning the 2010 version by just one point at 30-29 and Arizona stealing away the chances of ASU going to the first every Pac-12 championship game with a 31-27 victory. No matter what the records these two schools leave it all out on the field for the Territorial Cup and between the twisted history of the trophy and competitiveness of the games on the field this game earns the 77th spot on our list of must see events. Wisconsin survived the heat of Austin and advanced multiple men and women out of the West regional to the NCAA Finals but none did it as well as junior Rob Finnerty who took first in the 1500 meters. He set the pace as Wisconsin qualified seven men and eight women to the NCAA Finals in just about a week's time. Finnerty finished with a personal best time of 3:42.93 seconds, beating his closest opponent by just under 3 seconds. "I think a big part of this meet is that, the last two years, I've been the first guy out," Finnerty said. "This time around, I just told myself that I'm going to run my own race and not screw around for 1200 meters and then try to kick." Wisconsin had another great showing on the men's side from Mohammed Ahmed in the 5000 meters who finished 5th in the regional (top 12 from West and East qualfiy for the NCAA Finals). However, that's only because of how they set up the heats based off of finish and Ahmed's time was actually 3rd fastest in the field at 4:17.45, just .26 seconds slower than the 2nd best time at the meet. Ahmed, a junior this season, has a bit of time left as a Badger runner but clearly he's focused on winning a National Championship already. "I'm going there to enjoy it," said Ahmed in an interview post race. "It's a great experience, always fun, but I'm toward the end of my collegiate career and I came here to win an NCAA title." 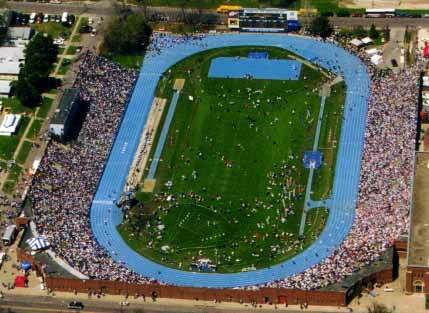 Joining Finnerty and Ahmed at the NCAA Finals in Des Moines will be Austin Mudd (800M), Elliot Krause (10,000M), Dan Block (Discus), Japheth Cato (Decathlon), and David Grzesiak (Decathlon). Dan Block probably had the most nerve racking day of the all the men on the Badgers team as he sat in 12th place after his final throw of the day with plenty of throwers left in the field. However, no one was able to step up to beat his qualifying throw of 56.68 meters. That distance came on his 5th throw and held on by just under one meter to allow him to advance to Des Moines. Over on the Women's side of the field the Badgers didn't score any victories in the races but were led by a 7th place finish from senior Monika Jakutyte in the High Jump. Don't let that 7th place finish fool you though as she cleared the same height as the winner at 5-10.75 feet. The field events were an overall success for Wisconsin on the women's side of the meet as Jakutyte qualified in the high jump and will be joined at the NCAA Finals by Jordan Helgren (Triple Jump), Taylor Smith (Shot Put), and Kelsey Card (Discus). The only women's track athlete from Wisconsin to qualify in Austin was Caitlin Card in the 10,000 meters. Helgren, a senior, had to sweat out her qualifying distance of 41-08.50 feet until the very end. She bested 13th place by three-quarters of an inch to make it to Des Moines. "I was so nervous," Helgren said post meet. "Every single jump made it more nerve-wracking. Seeing them jump and being next up just put more pressure on because you're just standing there thinking if she beats me I have to go twice as hard on this next one." However, qualifying for her first NCAA Finals of her career in her final season as a Badger was a sweet reward for all the nervous moments of the day on Saturday. "This is absolutely incredible," Helgren said. "I couldn't wish for anything else. It's the cherry on top of my entire athletic career." Joining that group will be the heptathlon trio of Dorcas Akinniyi, Jessica Flax, and Deanna Latham who automatically qualified for the NCAA Finals. The NCAA Finals will take place June 6th - June 9th in Des Moines, IA and we'll have all your updates via Twitter and daily recaps as the final events of the 2011-12 season wrap up for Wisconsin athletics. It's a 2-for-1 Friday on the MTB College Sports Bucket List. So make sure you scroll down a bit for the first event of the day, the Magic City Classic, which checked in at No. 79 on our list! With no DII football teams in the state of Wisconsin it's an area of the college sports landscape that gets under-appreciated, that is unless you've attended the only DII institution in the state - Wisconsin-Parkside. Just because our state doesn't pay a lot of attention to DII football doesn't mean there aren't great games and great rivalries out there. If you want that all you have to do is look to the MIAA and GLIAC for some of the best football games out there. The MIAA is home to the best rivalry in DII football, Northwest Missouri State Bearcats vs. Pittsburg State Gorillas who play annually in the "Fall Classic at Arrowhead"
These two have met a lot, dating all the way back to 1932 and the overall series stands at 23-22 in favor of the Gorrilas. However, what makes this game so high on this list is not just the closeness of the series, it's also how comeptitive these teams are on a national scale and the massive crowd that now follows this game in it's current format of the Fall Classic at Arrowhead. Since the move of this game to Arrowhead stadium these two teams have attracted over 20,000 fans for all but one game. Add in the fact that the Bearcats own the 7-4 advantage since that move and you have a rivalry worth seeing. Not only that, but these teams are annually some of the best DII has to offer. In 18 of the past 20 seasons both teams have been ranked in the top 25 of the DII polls and since 1992 these teams have combined for 10 appearances in the national championship game. Over 20,000 fans, Arrowhead Stadium, and highly touted teams at the DII level make this game a must see for any pure college football fan and thus ranking it pretty high on our list.